Confession: I used to envy people who could spontaneously burst into eloquent prayer. You know those people with all the right words. The ones who can remember the requests of everyone in the group. I always wanted to be just like whoever that was praying the right way. Then one day I was having a conversation with a friend who felt the same way. We were both afraid of being foolish in our prayers. Weather we were alone or in a group we felt like anything that came out of our mouths was foolishness, not eloquent and the wrong way to pray. We felt lost when asked to pray in a group and embarrassed that it wouldn’t be right or that we’d be laughed at … Oh to be in such company. As we were talking we had the realization that it didn’t matter! Even Paul knows our words don’t matter, in Romans 8:26-27 Paul writes “In the same way the Spirit helps us in our weakness. We do not know what we ought to pray for, but the Spirit himself intercedes for us through wordless groans. And he who searches our hearts knows the mind of the Spirit, because the Spirit intercedes for God’s people in accordance with the will of God.” The Spirit will offer groans and sighing that will out shine anything we can’t put into proper words. God will know what we are trying to say, what we are wanting to put into words even when we cannot. We do not have to be perfect, we do not have to have just the right words. We can talk to God as our friend, our Father in heaven. We can converse with God just as we are and the Spirit will intervene for us and we will all be pray-ers! Because to God it just doesn’t matter! Have you seen the new chalkboard at Easter on the Hill? You’ll find it in the gathering space, between the nursery and Fireside Room. 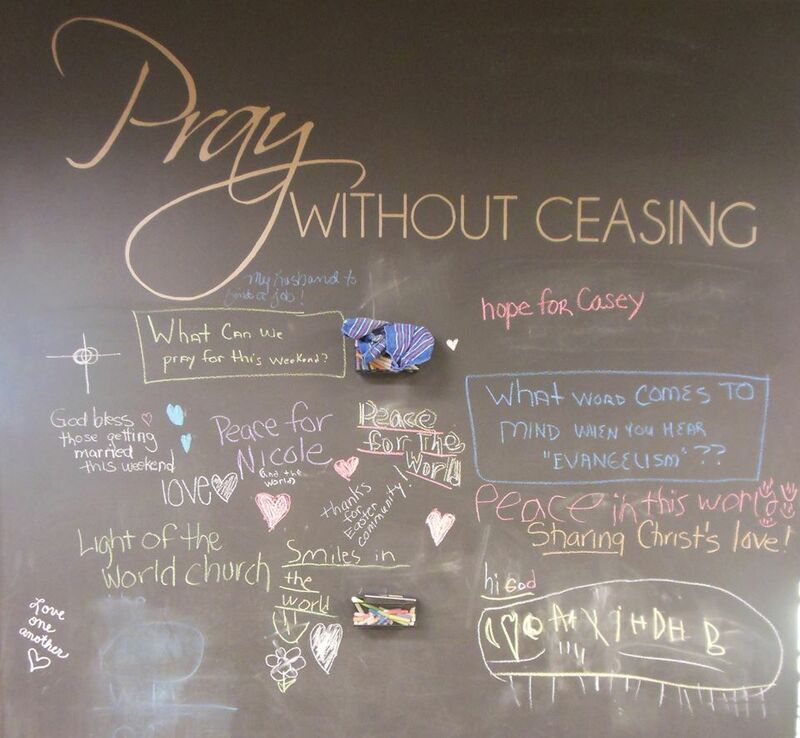 Pick up a piece of chalk and write a prayer intention. You can write a person’s first name, a symbol for your prayer, or a more general thing, such as “world peace.” There are questions appearing on the board, too–and you can write your response. Teens and children are encouraged to write their prayers, too! This is just one of many ways to show our love for one another, as brothers and sisters in Christ. Is any one among you suffering? Pray. Is any one of you cheerful? Sing prayers of praise. Is any one of you sick? Pray over the person. In all things, pray for one another.